I had been to Atlantic City once before, but have no recollection of the city from that time. I was 12 and traveling with family friends and we headed straight to the beach. 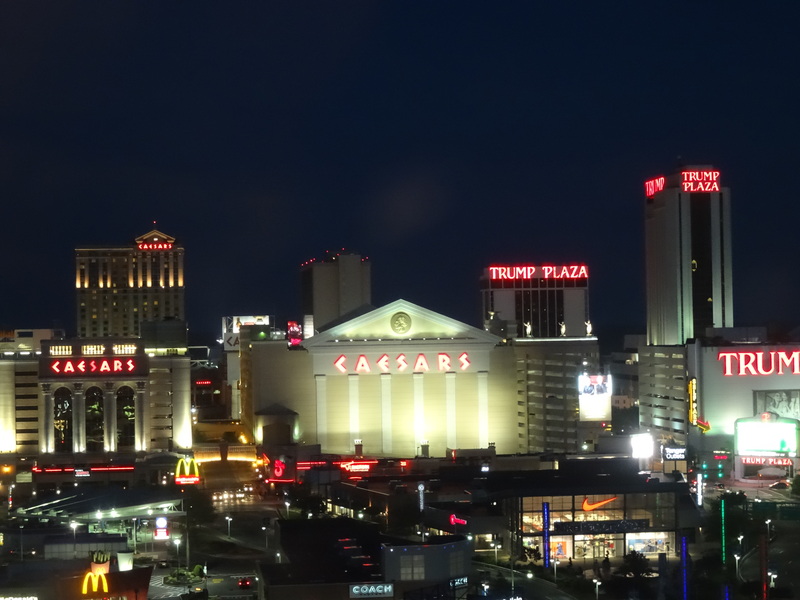 I didn’t really have a strong desire to visit Atlantic City again; however, Trey saw our visit to the Jersey Shore as an opportunity to play black jack and check out the casinos. He enjoys Las Vegas casinos, so I was fine with basing our Jersey stay in Atlantic City, as he has made numerous such concessions for me on our travels. We used points to stay at a downtown hotel adjoining the city’s convention center that had hosted Miss America Pageants since the pageant’s inception, but apparently not in a decade or so. 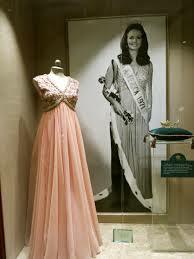 Throughout the hotel’s lobby and restaurant were exhibits of the evening gowns worn by past Miss Americas. Photos from the pageants were displayed all along the outside walls of the convention center. It was a bit like stepping back in time, except the exhibits dated only up to the year 2000, so it was more like the hotel and convention center were stuck in time, still basking in the glory of days long passed. Most of the casinos we explored had large sections of gambling tables closed and few people in the areas that were open. It was very evident that the city is no longer the east coast’s premier gambling city. Trey and I assumed that new competition from surrounding states is a large factor. An NPR story we happen to catch a couple of weeks after our visit confirmed this assumption. We also later came across a headline that reported the Miss America pageant is returning to Atlantic City this September. The area between our hotel and the beach was taken up by an outdoor Tanger Outlet Mall that looked relatively new, but few shoppers were taking advantage of the bargains. I came to the conclusion that Atlantic City should re-brand itself and invest in a serious PR campaign. The city has miles of great shoreline and great shopping; with some investment and change of focus, it could become the east coast’s new premier family destination. 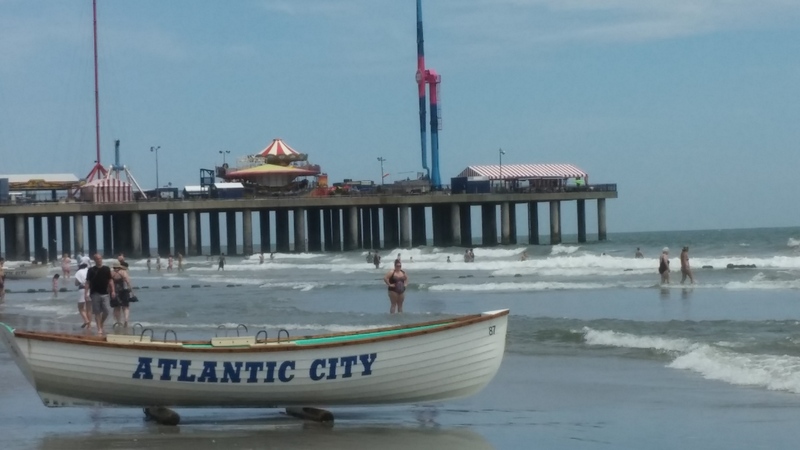 Our original plans were to go to Atlantic City and tour the coast, driving up and down the coast line to Avalon, Ventnor City, Cape May, and other small towns, but the best laid plans sometimes fall through. 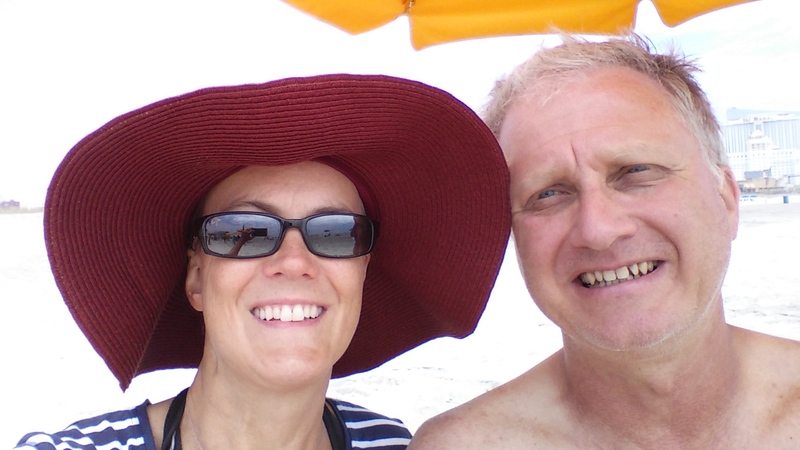 We left DC and headed to Baltimore where Mart flew to Austin the following morning for follow-up appointments for her ankle (see Wichita Mountains), and my job was to head to Atlantic City and get settled in. Despite missing my navigator, I arrived at our Atlantic City hotel fine around 4 p.m. 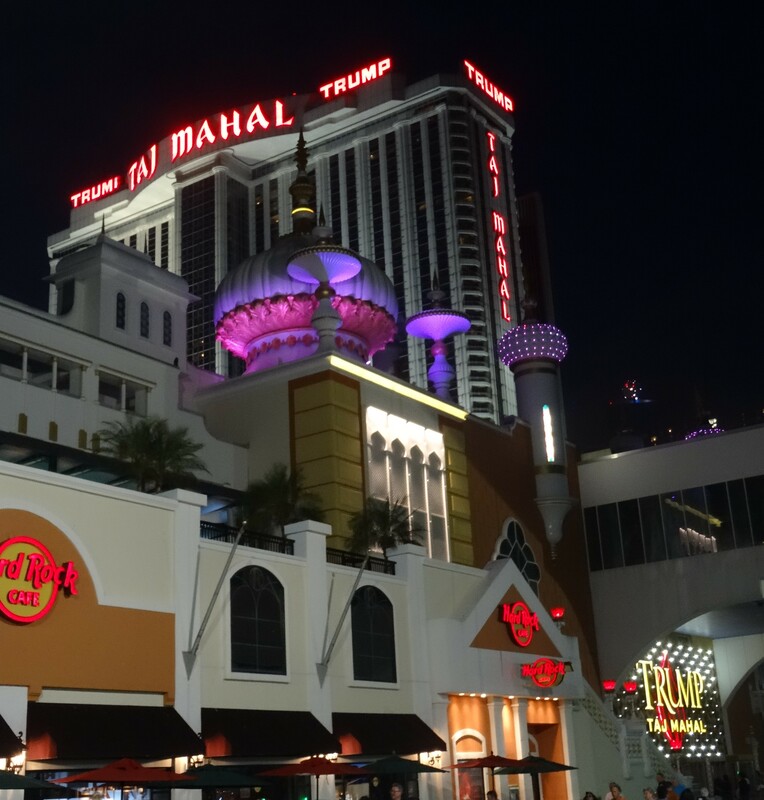 Being a card player, I was excited to head down to the boardwalk and check out the casinos. I cut through town for the Showboat Casino. 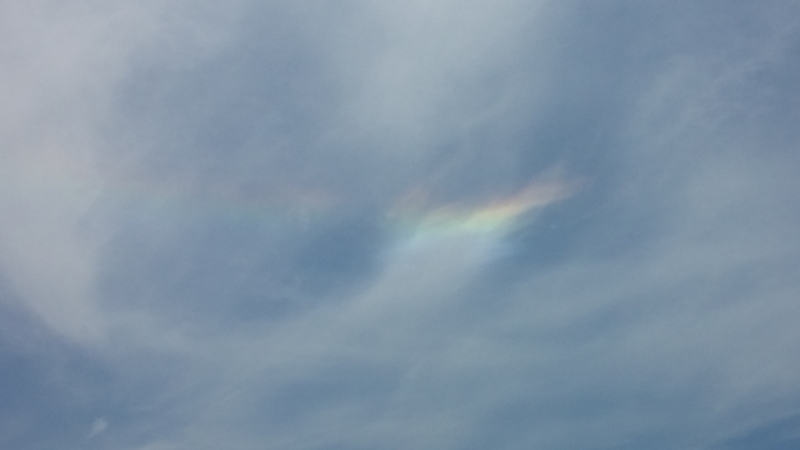 A prudent person would have headed straight toward the ocean and then worked their way up and down the boardwalk. Despite my off the beaten path route, I got there — live and learn. The boardwalk was great. The casinos, well, I will say, so so. I stopped in the Showboat, the Taj Mahal, the Resorts (Margaritaville), Bally’s, and Caesars. The action wasn’t anything like Las Vegas. 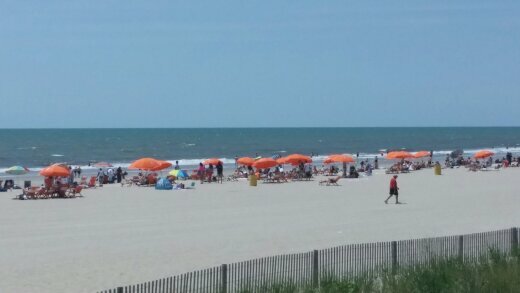 After several hours, I walked the boardwalk watching people. Upon leaving Caesars for the Sheraton, I middle-aged man on a BMX bike intentionally tried to run into me. This sent him flying in front of a car, missing it by inches. It wasn’t even a minute later, and he had run into a woman, lightly injuring her. Not sure if he was a pic-pocket or what, he scooted off quickly, looking back the whole time as cars and people were stopping to check on the woman. All I can say is beware! The following day I played cards a little more at Tropicana and Caesars before heading to the Philadelphia airport to pick-up Mart. I happened to find a replacement bicycle for the one stolen in Washington, D.C., at a bike shop near the University of Pennsylvania. Keswick Cycle staff quickly put it together for me and I was able to quickly swing by and pick it up on my way to the airport. 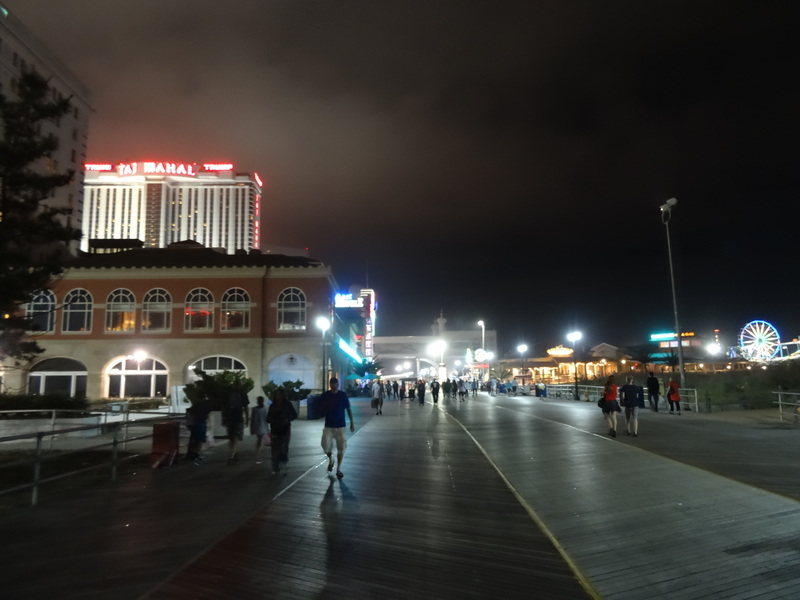 That evening we walked to the boardwalk and happened upon a light and music show. It was not as good as the downtown Las Vegas light show, but still interesting. The next morning we headed to the beach for a swim and people watching. Some may recall the 1980’s movie Working Girl. Well, we had fun watching a guy that could have been Alex Baldwin’s character from that movie – stereotypical jersey shore male. 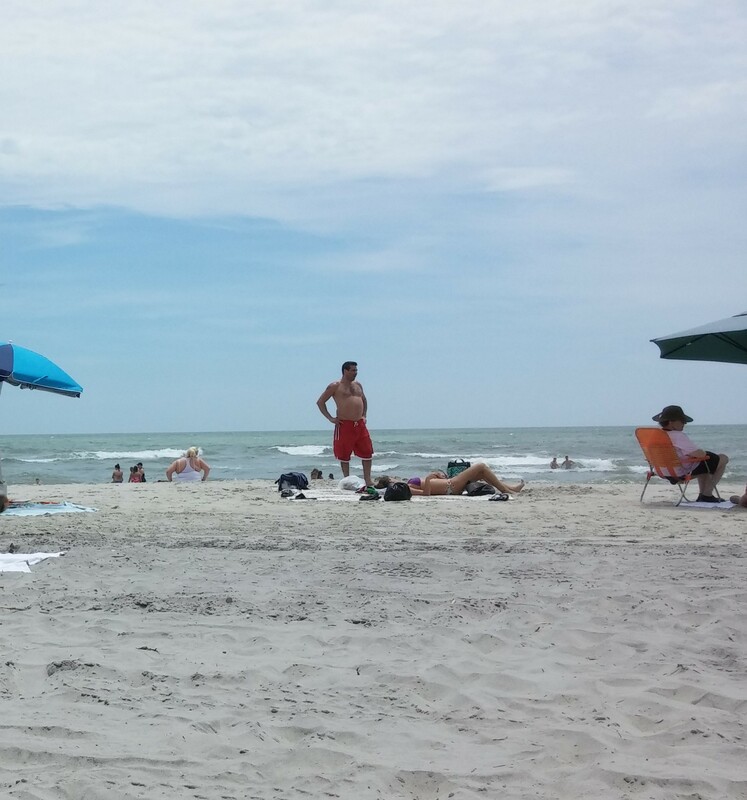 He had the accent, was on the phone with a cigarette in his mouth the entire time, including while his girlfriend rubbed sunscreen over his face. He even came back from getting into the water with his cigarette still lit even though he was completely soaked. I’m not sure how he managed that, but we had a nice laugh. Mart and I got in the water for a while. We had a young teenager following us with his bogey board, especially when we waded out in the ocean. We thought it strange, but then realized he didn’t want to be by himself out in the waves. I guess we were the shark bait. We had a great day, and that night walked the boardwalk again and I gambled a little. Overall, Atlantic City was okay, but I don’t think I would choose to visit it again.